European metal producers are continuing to push for safeguards on steel and aluminum products that could be diverted from the US by its 25% tariff. In the oil market, focus will be the Iraq Energy Forum in Baghdad where OPEC Secretary General Mohammad Barkindo is set to speak on Wednesday. Elsewhere, natural gas traders will be awaiting a decision from Dutch economy minister Eric Wiebes by the end of the week on production cuts at the Groningen field, which accounts for about 25% of EU gas output. Low gas stocks and threat of more wintry conditions are also pushing this summer's contracts higher on the expectation of strong demand for injection into storage. Finally, in the EU biodiesel market, not the cold but the end of antidumping duties will be turning traders’ attention to Indonesia. Our social media question for this week: Do you expect to see summer 2018 gas prices rising further? Tweet us your thoughts with the hashtag #PlattsMM. In this week's Market Movers: The OPEC secretary general speaks at the Iraq Oil Forum; and the European gas market awaits a Dutch production cuts decision. But first, the psychodrama over US President Donald Trump's trade policy continues as the European Commission seeks a permanent exemption for the EU from US steel tariffs. The EU and several other countries were exempted from the measures until the first of May. European metal producers are continuing to push for safeguards on steel and aluminum products that could be diverted from the US by the 25% tariff. 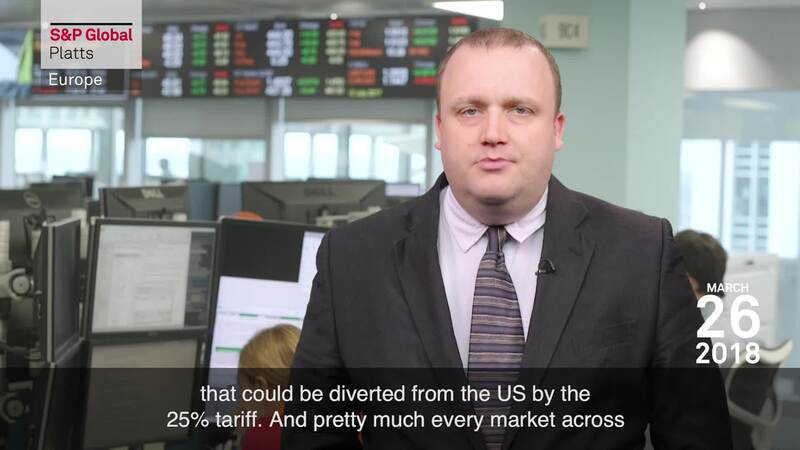 And pretty much every market across the world will be awaiting any further escalation in trade rhetoric between the US and China. In the oil market, another focus will be the Iraq Energy Forum in Baghdad where OPEC Secretary General Mohammad Barkindo is set to speak on Wednesday. Barkindo will be joined by Iraqi oil minister Jabar al-Luabi, the former prime minister of the Kurdistan region Barham Salih and a US State Department representative for a session on energy, the economy and geopolitics. Trump will loom large here too after his appointment last week of John Bolton as national security advisor. Bolton is hawkish on Iran, and market participants will be looking to see whether opposition to the Iran nuclear deal will gain more traction in US policy. In Europe, gas traders will be awaiting a decision from Dutch economy minister Eric Wiebes by the end of the week on production cuts at the Groningen field, which accounts for about 25% of EU gas output. The cuts are intended to prevent gas extraction from the field causing earthquakes. A drop from the current quota of 21.6 billion cubic meters a year -- already significantly below the 2013 production peak of 53 billion cubic meters -- would make the Netherlands more dependent on imports and tighten the European gas market. And gas shortages are already making their presence felt, with European stocks at multi-year lows. A third spell of unseasonably cold weather in Northwest Europe at the end of this week is set to reduce inventories even further. This prospect is supporting prompt prices. The low stocks and threat of more wintry conditions are also pushing this summer's contracts higher on the expectation of strong demand for injection into storage. And that's our question for social media this week -- do you expect to see summer 2018 gas prices rising further? Answer with the hashtag #PlattsMM. In the biodiesel market, not the cold but the end of antidumping duties will be turning traders’ attention to Indonesia. European prices were left reeling at the end of last week after duties on most Argentinian and Indonesian biodiesel in place since 2014 were removed. This paves the way for increased imports into Europe. Since a cut in the duties against Argentina in September, almost a million metric tons have been booked. Thanks for kicking off your Monday with us, and have a great week ahead!